INSUALTION HYDRATION COMPARTMENT - Made of thickened aluminum foil material, the insulated hydration compartment fits bladder about 2 L and keeps liquids cool for up to 4 hours. The interlayer built with a velcro to fix the bladder solidly. LOADED WITH FEATURES - Adjustable belt for maximum comfort and stability, strap clips to keep extra straps secure. 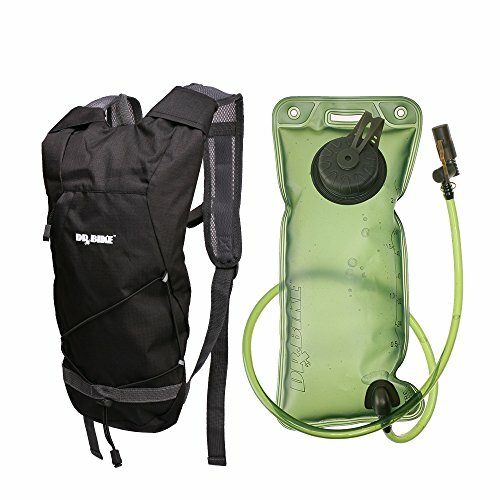 MULTIPURPOSE - This camel pack is perfect for men, women and youth to keep you hydrated while running, cycling, and hiking; 2L hydration bladder included. FDA APPROVED - 2 Litre large capacity, Food-grade premium quality anti-bacteria materials. Thick bladder material is pressure-tolerant and wear-proof. Hold the weight 100 lbs without any problem. CONVENIENT - The mouth piece that's extremely thick and soft for water to flow smoothly and easily. For your convenience, there's a accessible shutoff valve for easy drinking and a antimicrobial mouthpiece for your health. If you have any questions about this product by DRBIKE, contact us by completing and submitting the form below. If you are looking for a specif part number, please include it with your message.